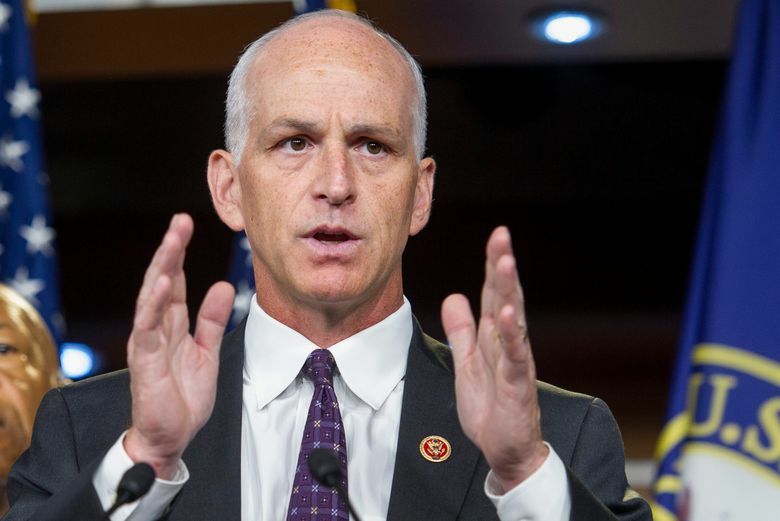 Rep. Adam Smith, D-Bellevue, says President Trump's embrace of Russia President Vladimir Putin over U.S. intelligence agencies is further ground for impeachment. U.S. Rep. Adam Smith, D-Bellevue, joined a chorus of condemnation Monday against President Trump’s conduct at the Helsinki summit — and went further than many by suggesting Trump had committed treason. In a statement, Smith, the ranking Democrat on the House Armed Services Committee, said everyone should be concerned about Trump’s closed-door discussions with Putin. “At every turn of his trip to Europe, President Trump has followed a script that parallels Moscow’s plan to weaken and divide America’s allies and partners and undermine democratic values. There is an extensive factual record suggesting that President Trump’s campaign and the Russians conspired to influence our election for President Trump. Now Trump is trying to cover it up. There is no sugar coating this. It is hard to see President Trump siding with Vladimir Putin over our own intelligence community and our criminal investigators as anything other than treason,” Smith said. In an interview, Smith backed away somewhat from the legal meaning of “treason” — a crime which the Constitution defines as levying war against the United States “or in adhering to their enemies, giving them aid and comfort.” The rarely charged crime can be punished by penalties up to death. “Treason might have been a little bit of hyperbole,” Smith said. He said his point is that there is plenty of evidence Trump has committed impeachable offenses and is unworthy of holding office. “There is no question in my mind that the United States has the need to begin an impeachment investigation,” Smith said, citing Trump’s efforts to halt Special Counsel Robert Mueller’s investigation into Russia’s election interference. Smith said there is already plenty of proof of conspiracy between high-level Trump campaign officials and Russian agents. But Smith said any effort to impeach Trump would be more credible once Mueller’s report is complete. He has not signed on to impeachment resolutions offered by some Democrats. Other Washington congressional Democrats also criticized Trump strongly in public statements. This is what the world is seeing right now: "Trump sides with Russia against FBI"
Among Republicans, U.S. Rep. Dave Reichert, R-Auburn, also criticized Trump’s comments, though in less fiery language. “As investigations have proven, Russia interfered in our elections. This foreign attack on our democratic process threatens the very foundation of America. Those who have perpetrated interference in our elections will be held accountable. This is the message the President should deliver to Russia,” Reichert said in an emailed statement. Reichert’s spokeswoman did not respond to a request for information on actions he might take in response.